Could the Next iPhone Really Be A Third Smaller Than iPhone 4? 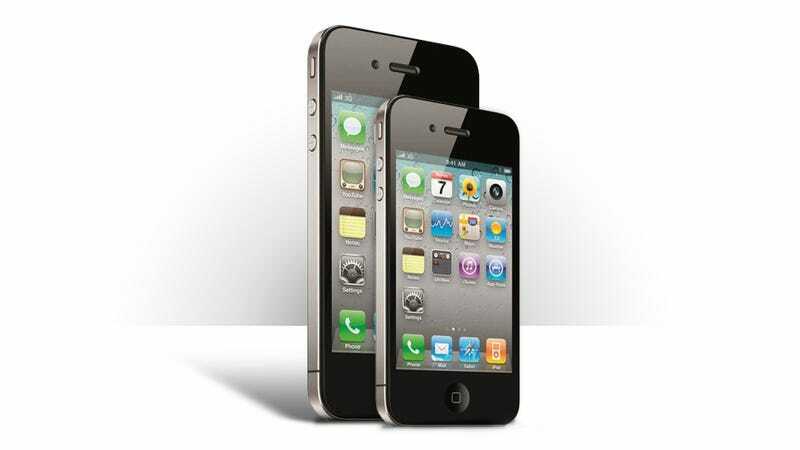 According to Bloomberg, the next iPhone may be two-thirds the size of the already (very) petite iPhone 4. That's crazy small. But will it happen? Maybe, maybe not, according to Bloomberg's sources, who saw the prototype sometime last year. Apple has considered announcing the tiny handset this summer, but could still decide to scrap it in favor of a different model. Let's also keep in mind that two-thirds smaller could be referring to a lot of things; the length of the diagonal, the thickness, the weight. It's hard to imagine that the 66.67% iPhone shown above would be particularly usable. If Apple does go small, there are also plans in the works to offer the next iPhone for just $200 off-contract; the current cheapest iPhone goes for that amount only with a two-year service plan). And even if Apple decides to stick closer to the current form factor, they're still intent on giving iPhone 5 dual-mode powers (like the Verizon iPhone 4 almost had), as well as a "Universal SIM" that would let users switch back and forth between GSM networks without having to switch out your SIM card. That price, with those features, and that size, would be a pretty unprecedented leap forward; certainly enough to confirm Apple as the frontrunner in its ongoing mobile battle with Android. Also intriguing is the possibility that Cupertino might expand its offerings to include multiple form factors at once, something they've steadfastly avoided since their very first handset.